On Friday, UCU national executive committee meeting began with a silence to commemorate the victims and all those affected by the terrorist attack which targeted mosques in Christchurch. Our emergency statement [here] confirms our commitment as an education union to take the lead in ensuring that people of faith are protected and have a safe environment to learn and pray. Please join together today at the vigil for victims of the terrorist attack against mosques in Christchurch, New Zealand. This has been co-organised by the LUU Islamic Society, LUU Ahlul Bayt Islamic Society, LUU, and the chaplaincy. We will meet outside LUU (in the precinct) at 1.30 today, until 1.45pm. Today and every day Leeds UCU stands in solidarity with our Muslim members and students here at Leeds, and around the world. We condemn all acts of hatred and Islamophobia. Together we are stronger. Today we send a strong statement that our university community says NO to Islamophobia. Please do take 15 minutes to join the vigil if you are able. Please come to the members’ meeting tomorrow: every voice matters! If you have never been to one of our branch meetings before, it’s a great one to start with: we have a very full agenda (attached!) dealing with many challenges we face as a sector and as a society. 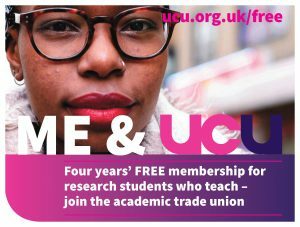 We have updates on local negotiations over the gender pay gap and imminent negotiations over casualisation at the University of Leeds, and a significant number of decisions to make as a branch regarding local policy and what we would like to take forward to the annual UCU Congress and Higher Education sector conference. We will also agree our delegates to represent the branch at Congress this year. On Friday UCU announced the nominations process and timeline for [electing a new General Secretary] after Sally Hunt’s resignation. Nominations are open until 5pm on Monday 8 April 2019. 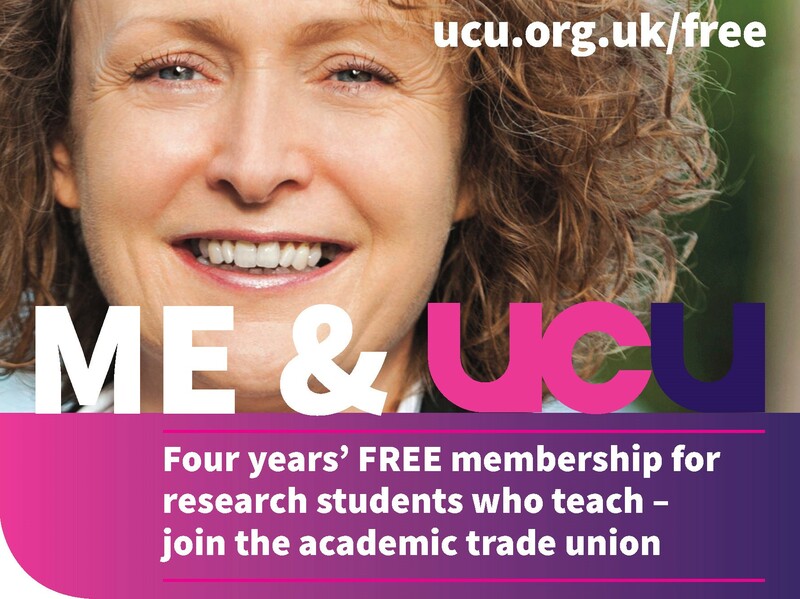 Members and staff of UCU are eligible if they meet requirements and nomination guidance outlined [here]. Once nominations are confirmed, there will be an election by postal ballot which will run between 29 April – 23 May 2019. 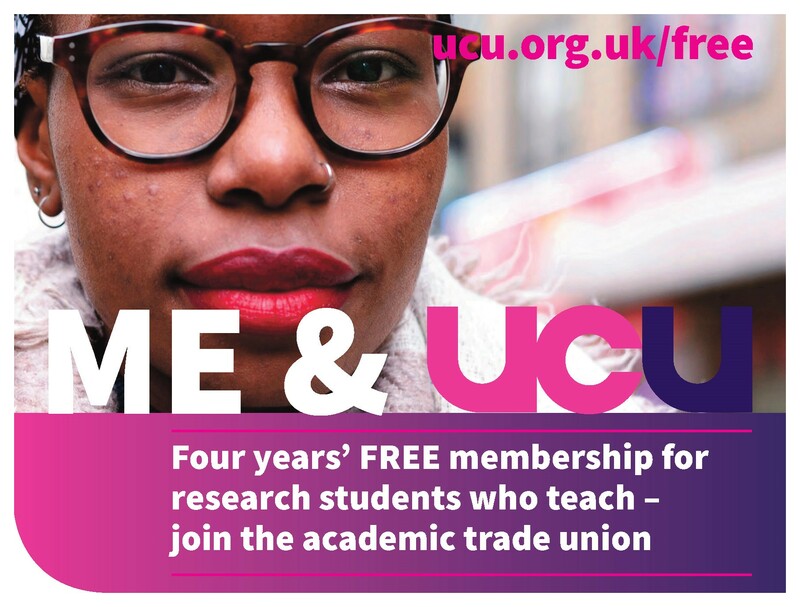 As with the recent UCU officer and NEC elections, the mechanism will be by Single Transferable Vote, meaning members can vote for more than one candidate in order of preference. The successful candidate will hold the position for 5 years. This is an incredibly important election for the future of UCU. However, in previous years the turnout in elections for the role has been very low across the membership. We hope to address this democratic deficit at Leeds! It is our hope that every single member eligible to vote will return their ballot! As such, please let us know (ucu@leeds.ac.uk) what you would find useful in making your decision about who to vote for and in which order. We hope to organise a large hustings event at Leeds, and will seek permission from candidates to film this to widen access to it. Support Bradford College UCU Strikers! Bradford College UCU are due to strike for 3 days: 20th, 21st, 22nd March 2019. Members in Bradford have experienced a 25% reduction in pay in real terms, with no significant pay rise at all in 10 years. In comparison, school staff have received a 3% pay rise applied to pay scales that already tend to exceed the rates paid to staff in colleges. Bradford College staff are suffering under hugely increased workloads and high levels of accompanying stress. Spending on the Bradford College senior management team has risen while the wage bill for lecturers has fallen. Consider this context of a refusal to move into meaningful talks for over six months, playing for time under the restrictive (anti-)Trade Union Act 2016 laws until the ballot mandate runs out, versus the positive moves made by the City of London Group where staff were awarded a 5% payrise and many casualised staff moved onto more secure contracts. Write to the latest Bradford College CEO Chris Webb: c.webb1@bradfordcollege.ac.uk to express disappointment at the failure of the executive to engage in meaningful pay bargaining (and their refusal to meet until after the next 3 days of action). Send individual messages of solidarity to the branch. Members will have seen in last week’s all-staff communication the reminder that our USS pension contributions will be going up from 8% of Salary to 8.8% of salary, as from your pay slip at the end of April. We will be receiving letters from the USS this week with further details. We have communicated this known forthcoming contribution a few times in updates on pensions in the last few months. This is the first of a series of increases in contributions that were triggered last summer as a result of a failure to agree the 2017 valuation – the source of the big pension strike this time last year. Further increases will take place if no agreement is reached – and you will see these mentioned in the USS letter and by following links from the all-staff email – but please note that there are no employers who desire these further increases and the pressure is on to come to a conclusion and agree a way forward to avoid them. Members will recall that the Joint Expert Panel was established on the back of our strike, and its first report came out last September. Partially in response to that, USS proposed to put forward a 2018 valuation that might replace the contentious 2017 one. This is currently being consulted upon by employers. The further increases that have been slated could be stopped or replaced as a consequence, and we’ll report on the outcome of these when we know them. Current pressures are growing around the issue of so-called ‘contingency contributions’, which employers would be asked to make in specific circumstances. Neither the employers nor UCU think these are a good idea, but USS remains reluctant to agree to all the recommendations of the JEP. In associated news, a recent article by respected pensions journalist Josephine Cumbo argues that USS’s failure to be transparent – something that has long been argued by UCU and more recently by employers – sends a warning to pension schemes more widely, and queries the motivations of the regulator.http://www.pensions-expert.com/Comment-Analysis/USS-dispute-has-exposed-a-transparency-deficit? Sam Marsh outlines the implications of this misrepresentation of the Pension Regulator in a series of tweets early last week: https://twitter.com/Sam_Marsh101/status/1103589129328250882 Marsh here points out that the new information calls into question the integrity of the USS executive team, who had rejected some of the JEP proposals arguing that the Pensions Regulator had internal benchmarks that dictated what they could do. This having been refuted by the Regulator, USS appears exposed as having seemingly manufactured arguments to support their valuation methodology, something that has always been at the core of our dispute over projected deterioration of our pension. More than 30 climate researchers from the Priestley Centre at the University Leeds attended one of the previous two youth strikes for climate that took place in Leeds in March. At each event they took the opportunity to talk to young people and Leeds residents about the climate crisis, and answered a range of questions. Answers to some of them are online here. We’re certain that our climate researchers are not the only ones who believe the youth are doing brilliant things by striking for the climate. 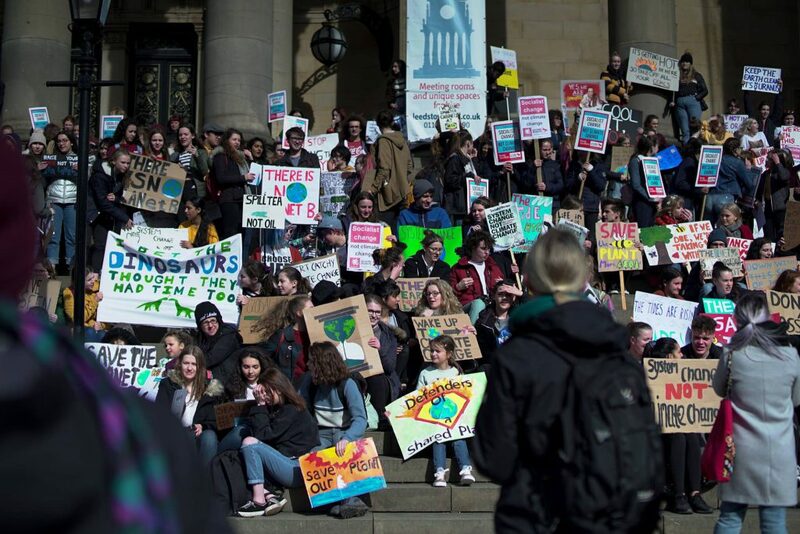 We’ve spoken to some of the organisers in Leeds (our own students) for the next climate strike taking place 11am-2pm Friday 12th April, and we are calling on University staff to come along to show their support. The time is now to take action to avoid climate breakdown. It is crucial that staff at the university have a voice and take a stance in this universal human life threatening issue. The children are leading the way. Let’s go and show them that they are right, and that they have our support. UCU is part of a wider regional network of unions concerned about the climate crisis and searching for coalitions in our workplaces. Locally, we have passed a motion on creating a finance group that monitors UOL external investment that damages the environment and contributes to raising Co2. Leeds UCU is developing a campaign for divestment. Motions to this effect will be brought to the next UCU general meeting (Thursday 2nd May 1-2 pm Roger Stevens 8.04). Please come to this meeting to help us show how important this issue is for our union. The university has agreed to identify parameters they think they can align with to publish a joint statement on casualisation. We anticipate formal time-limited negotiations to begin shortly but further steps in this regard require active engagement from our casualised members. We are putting together a survey to find out the details and extent of the casualisation problem at Leeds and also planning towards a meeting of all casualised staff that will soon be announced. 1pm – 2pm, Roger Stevens lecture theatre 4 (8.04). The deadline for motions or agenda items for this meeting is 12pm Tuesday 16 April. If you want our branch to propose an amendment to a motion on the UCU congress 2019 agenda, or propose an emergency motion to UCU Congress, or to encourage our delegates to the congress to vote in a particular way on a motion at UCU congress, this is the meeting to put that to. 3.45pm – 5pm, venue to be confirmed. The deadline for motions for the AGM is 12pm Tuesday 30 April. The deadline for nominations to elected committee positions is 3.45 Wednesday 15 May. 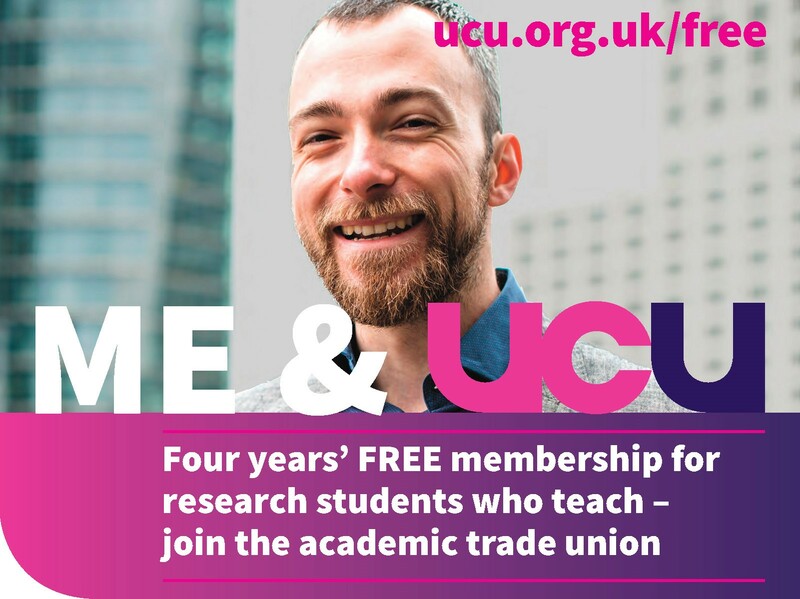 Our pensions rep Mark Taylor-Batty and Sam Marsh (one of UCU’s elected national negotiators on USS) will give an update on the current situation and lead discussion with members. Please bring your questions too! We have deliberately timed this meeting to fall after the next USS negotiation meeting between UCU and UUK. You can help to publicise this by printing and distributing this leaflet. The employers’ body Universities UK (UUK) has recently conducted a consultation of member institutions regarding the USS 2018 pension scheme valuation. UUK has written to USS with a summary of the institutional responses which they have published [here]. The University of Leeds put its consultation response online yesterday, which is [here]. We (UCU) have many and growing concerns in the sector over the governance of the USS pension scheme, and poor communications from the USS executive. You can read the latest statement from the UCU National Disputes Committee which was convened after Congress 2018 to steer the USS dispute [here]. We had hoped that our University position would take full account of these concerns. We note that several other key employers in the USS scheme have consulted with UCU branches on these important issues and/or have taken a much more critical / questioning position in their consultation responses, and have made these concerns public. For example, the University of Oxford and the University of Sheffield, have rejected the call for contingent contributions. Sheffield goes further and argues that the institution “continues to have serious concerns regarding the approach taken by the USS Trustee to the 2018 Valuation”. The Deputy director of HR at Sheffield wrote “the contentious nature of the methodology adopted by the USS Trustee in undertaking both the 2017 and 2018 Valuations, and the lack of transparency and explanation/rationale behind decisions and positions of the Trustee, is leading once again to a position whereby key stakeholders do not have trust in the figures and outcomes resulting from the latest valuation.” We find it difficult to believe that the University of Leeds council have been able to look at all the given information and not also come to this same conclusion. The University of Bristol express disappointment that the USS trustees have not “fully reflected the JEP’s recommendations in the 2018 valuation technical proposals to date.” The University of Edinburgh make a similar point and ask for further commentary on that decision. The University of Newcastle, in a similar vein, reiterate that they “support all the recommendations made by the JEP”. The University of Warwick specifically foregrounded the JEP’s assessment and criticism of ‘Test 1’. The University of Bristol’s recommendation that USS should appoint more member-nominated trustees is a proposal we would wish our own employer seriously to consider backing. What next? Come to this meeting to be part of the discussions we will feed back to UCU at the UK-wide level. We have fought hard to defend our pensions — to keep doing this we need to make sure everyone knows what’s going on and that members are able to feed into what happens next. We need members’ views on the draft Code of Practice for REF 2021 (CoP) that the university released for consultation yesterday. We are looking to build on the wealth of experience and expertise in our membership to inform the branch’s position. To this end, we have put together a very short survey that can be completed [here]. Alternatively, you can email your comments to us directly at ucu@leeds.ac.uk. and the process for selecting outputs [CoP para 76-84]. Alongside providing your feedback to UCU, we also encourage members to engage with the university’s consultation process by either emailing leedsref@leeds.ac.uk, or by attending one of the three drop-in sessions organised by University Management, details of which can be found [here]. We are holding a Leeds UCU Emergency General Meeting on 2 April, at 2pm, in Michael Sadler LG 19 to discuss the Code of Practice, as well as other REF related concerns. Please do come along if you are able, and if you would like to propose a motion / motions for the branch to consider as policy positions please email ucu@leeds.ac.uk — including if you would like any advice on how to draft them. The motions deadline for the EGM is 2pm on Monday 1 April.